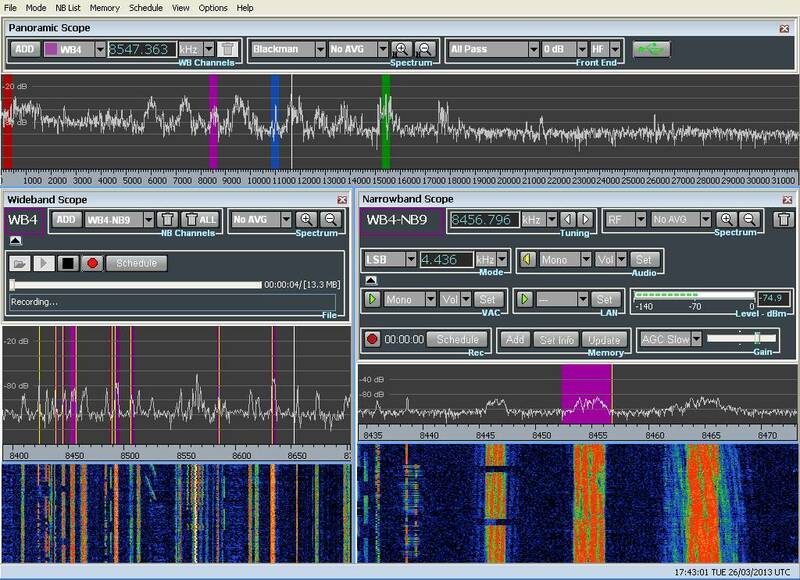 Titan SDR: monitor, analyse and record up to 40 HF channels in parallel! Titan SDR receivers are designed to monitor, analyse (decode) and record a large number of frequencies at the same time. The standard version of the Titan SDR can use 8 channels in parallel, the Titan SDR Pro version can handle up to 40 channels at the same time. This greatly simplifies monitoring station which used to employ a huge number of antenna distributors, receivers and other accessories. The whole setup is reduced to one or multiple high performance receivers and a computer, which can manage a large number of observations at the same time. The TitanSDR receivers offer a maximum display bandwidth (panoramic scope) of 32MHz. This huge spectrum does have a minimum resolution bandwidth (RBW) of 305 Hz. Within this spectrum four (4) wide band ranges can be placed, which can occupy a bandwidth between 312 and 2187 kHz, but al lfour not exceesing a total bandwidth of 2187 kHz. Within the wideband spectra the operator can place 8 (stadard version) or 40 (Pro version) narrow band receivers. Each narrow band receiver can monitor, analyse and record the transmission on that particular frequency. The bandwidth for each narrow band receiver can be adjusted up to a maximum of 22 kHz, allowing for easy analysis of such wide signals. The resolution bandwidth of a narrow channel can be adjusted between 5.4 to 21.5Hz. The first stage of the receiver is constructed of an attenuator and an elaborate pre-selector filter bank. The 4 level attenuator can be set to 0 to 30dB in 10dB steps. 16 overlapping filter ranges and one additional low pass filter provide very good large signal handling capabilities of thsi receiver. This makes the use of the TitanSDR receiver possible even in the vicinity of transmitter staions, without overloading the first stage. After the pre-selector additonal amplifier and filter stages prepare the signal for the state-of-the-art 16 bit analog/digital converter (ADC). The ADC is sampled (clocked) with 80 MS/s and thus offers a professional dynamic range and signal resolution. The later stages in the receiver are an FPGA chip which reduces the signal further as most SDRs do, finally the receive signal is sent by an USB 2.0 full sped interface to the computer. The supplied Windows software (for Windows XP, Vista, 7, 8 (32 Bit)) is used for operation of the TitanSDR receiver. The program shows separate areas for the wide panorama spectrum (0-32MHz), the one to four wide band ranges and the up to 40 narrow band channels. The wide band and narrow band displays show both a spectrum and a waterfall diagram. One wideband signal can be recorded for later analysis. This recording uses a proprietary format, playback is done with the same software. The audio data from the 8 (standard version) or 40 (pro version) narrow band channels can be processed in many flexible ways. Either send it to a built in sound card for listening, or send it by means of a so called 'virtual audio cable' (VAC) to a decoder software running on the same computer, or make a recording in standard .WAV format (VAC and decoder software not included). The Pro version of the TitanSDR even allows the audo data to be sent over a network interface to another computer, running analysis and decoder software, for example Krypto500 or Hoka Code300. With this feature the TitanSDR can easily be integrated into a professional monitoring infrastructure. The software further provides a very sophisticated scheduling system for automated recordings. The operator can choose to do one time or periodically recurring recordings. With the many parallel channels provided by the TitanSDR an analysis of most complex systems operating in parallel becomes possible. The setup for single narrow band channels as well as wide band range configurations can be stored and recalled easily. This allows for even very complex scenarios to be recalled quickly. Another feature of the software is a comprehensive remote control capability via the local area network, allowing to control nearly every aspect and function of the receiver. The data format and protocol for this remote control is published and offers software authors to use their own programs and extensions to the TitanSDR. The TitanSDR receiver has a solid metal case (size 243 x 52 x 145mm). The power supply is done by an externally provided DC voltage of 6V, a linear power supply is provided. Although the linear p/s is larger and heavier, it avoids all noise problems often found with switching power supplies. The antenna connector is a BNC socket. Further data can be found in the TitanSDR data sheet.